In the last ten Super Bowls, the Most Valuable Player award has been handed to the quarterback of the winning team seven times, so anyone concerned that New England may win the Super Bowl but not cover the three-point handicap could do worse than back Tom Brady to take the crown. There are several reasons why Brady should be a good bet as long as the Patriots win the big match. Should he be successful, he would break Joe Montana's record and be handed the award for the fourth time. Additionally, the Deflategate controversy, which caused him to be suspended for the first four matches of the season, could work in his favour. The whole episode left a lot of bad blood between the NFL and the Patriots and it would be tempting for mischievous media and fans who vote for the award to give the showpiece award to Brady given the slightest justification. But perhaps more telling is that with a high-scoring game anticipated, it will be up to the two quarterbacks to make that happen and it is no surprise to see Brady's opposite number Matt Ryan at 7-4 to gain the award. Running backs have a terrible record with just three gaining the MVP prize since 1984 and with both teams having so many receiving options, it is difficult to imagine that one will be singled out to such an extent that he makes a huge individual contribution. Two of the last three awards have gone to defensive players and Falcons linebacker Vic Beasley, who had 15.5 sacks in the regular season, is the most highly fancied, but he is 66-1. Much of the attention will centre on Falcons receiver Julio Jones, who is favourite to score the game's first touchdown even though, for all his 1,409 yards, he scored just six times in 14 regular-season matches - he missed two games with a toe injury. New England running back LaGarrette Blount looks much better value at 8-1 when you consider he scored 18 TDs and it could also be worth going low on Jones' receptions at 7.5 with Sky Bet. Atlanta's number 11 should expect plenty of attention from the Patriots secondary and it has been the spectacular nature of many of his plays that have caught the eye this year rather than a huge number of receptions. Jones has eclipsed Sky Bet's line in just five of 16 outings this season and any extra attention he receives could benefit his colleagues, especially fellow receiver Mohamed Sanu. 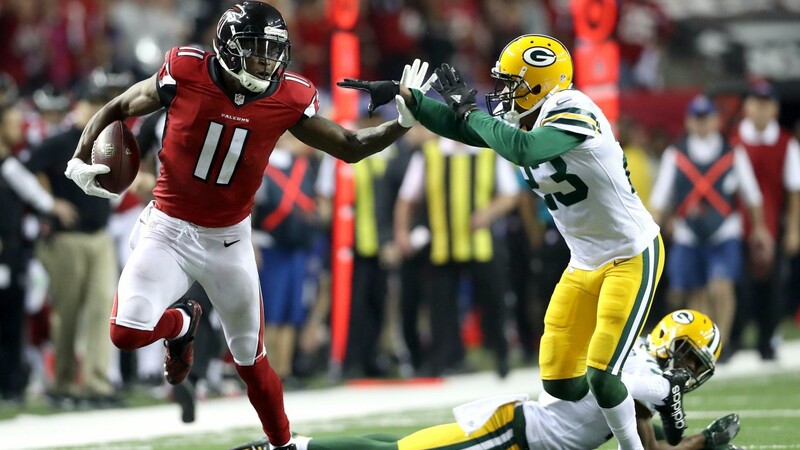 Sanu was heavily utilised in the NFC Championship win over Green Bay and he looks good value to score a touchdown. Running backs have a terrible record with just three gaining the MVP award since 1984 and with both teams having so many receiving options, it is difficult to imagine that one will be singled out to the extent that he makes a huge individual contribution.